BY POPULAR DEMAND! A selection of our most popular cookies bundled into a single dozen. Choose whichever option suits you best. For speciality dozens which are not represented here feel free to email or call the store to see if we can accomodate. We're happy to try, and eager to offer cookie solutions to your most complex culinary problems. Cookies are baked fresh, sealed in 6 packages of 2 then shipped as a whole dozen. Shipping is a flate rate of $6.00 per order, per address. No Matter How Big Your Order. BUY LOTS and Pay Just $6.00 Flat Rate Shipping. For those in the Eugene / Springfield area that wish to order on-line for in-store pickup - YOU CAN! Simply select "Local" when on our shipping page. You will not be charged for shipping, though there is a $1 handling fee per order (not per item). Orders received before 3pm will be processed the Same Day and ready in One Hour. About Allergens in our Facility. At Crumb Together all of our ingedients are not in all of our items, but they are processed in the same faclity. We do our best to avoid cross-contact but we are not an allergen-free facility. If your have a severe allergy to any of our ingredients please do NOT order from us. Our cookies may contain: eggs, flour, tree nuts (including hazelnuts, pecans, coconut) and peanuts. Our Gluten-Free products are also protected from cross-contact but are produced in a facility that uses flour. Those with severe Gluten allergies should not order these cookies. 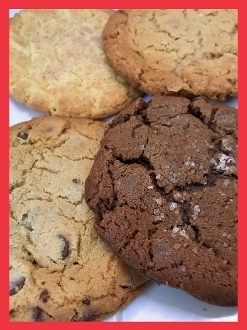 For those with Milk or Lactose intolerance - all of our cookies are produced WITHOUT milk or butter. Copyright © 2018-2019 Crumb Together. All rights reserved.